Everyone has their own ideas of what poetry means to them. The power of poetry can bring people together from nations all across the world. The bond human beings share with words is a life long relationship. Being able to express your mind and the raw emotion of your heart is so important. 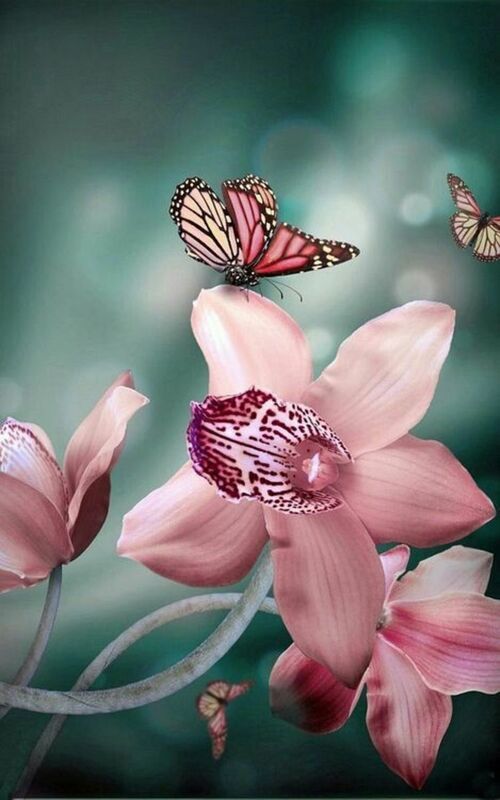 Poetry is the ability to open up and relay those emotions to other people. A rare unique ability to paint a vivid picture to the reader with words. There are many forms of poetry. I write mostly Free verse poetry and Acrostic. I combine euphemisms with double compound syllable rhyming. Having the ability to rhyme and perfectly place words can't be done by many people. Anybody, can write free verse poetry, yes! However, an apple is not a pair no matter how you slice it. Keeping a steady flow to your poetry like the Ocean waves is my philosophy. I like to fuse the real world into this to give it serious meaning. Example : Keeping a steady flow, like continental drift unknown, flowing like the Ocean waves go, you know? The ability to rhyme has always come natural to me. I am a true wordsmith at heart and love writing Poetry. I have also developed a love for Acrostic Poetry. The ability to break down a words whole meaning using its own letters. I really believe the greatest writers can relay the most messages in few words. This develops over time allowing them to reach any audience. So, what does Poetry mean to you? What is your favorite type of poetry? The various styles are endless like the skies. Abstract (or Sound) Poetry. Abstract was a term used by Dame Edith Sitwell. Acrostic. A form for hidden messages. Ae Freislighe. Irish quatrain with intense rhyme scheme. Alphabet Poetry. Perfect back-to-school poetry. Anagrammatic Poetry. More fun with letters. Blackout Poems. Making poems from articles. The Blitz. 50-liner invented by Robert Keim. The Bop. 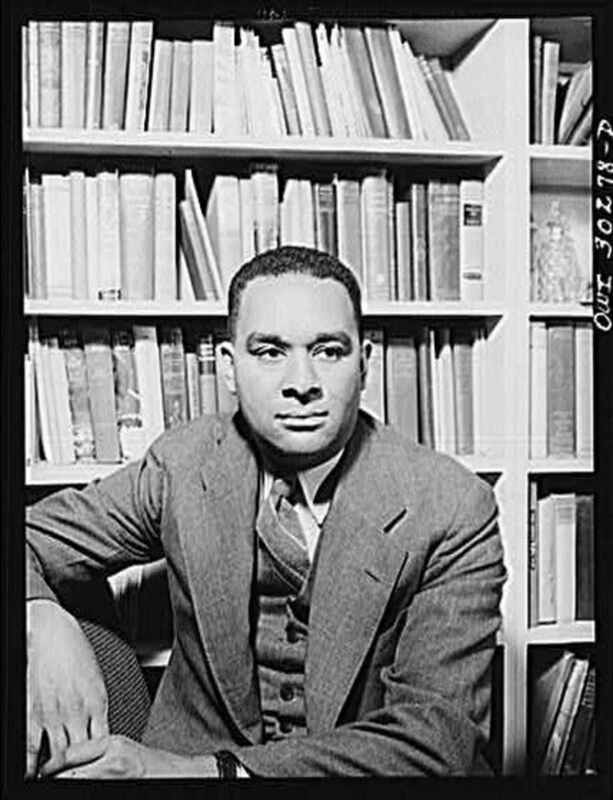 Three stanzas and three refrains, developed by Afaa Michael Weaver. Byr a Thoddaid Poems. Welsh quatrain. 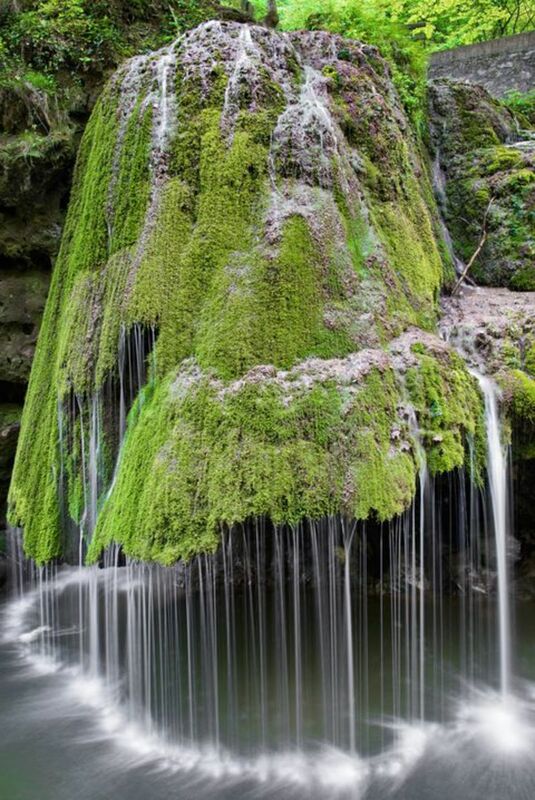 Cascade. Variable length form invented by Udit Bhatia. Chanso. Five to six stanzas with an envoy. Chant. If it works once, run it into the ground. Contrapuntal Poems. Independent poems that get intertwined. Curtal Sonnet. 11-line sonnet invented by Gerard Manley Hopkins. Cyrch A Chwta. 8-line Welsh form with 7 syllables per line. Cywydd Llosgyrnog. 6-liner with internal rhymes and variable syllables. Decima. Various versions of 10-line forms. Descort. French form that makes each line special. Diminishing Verse. Poems that disappear one letter per line. 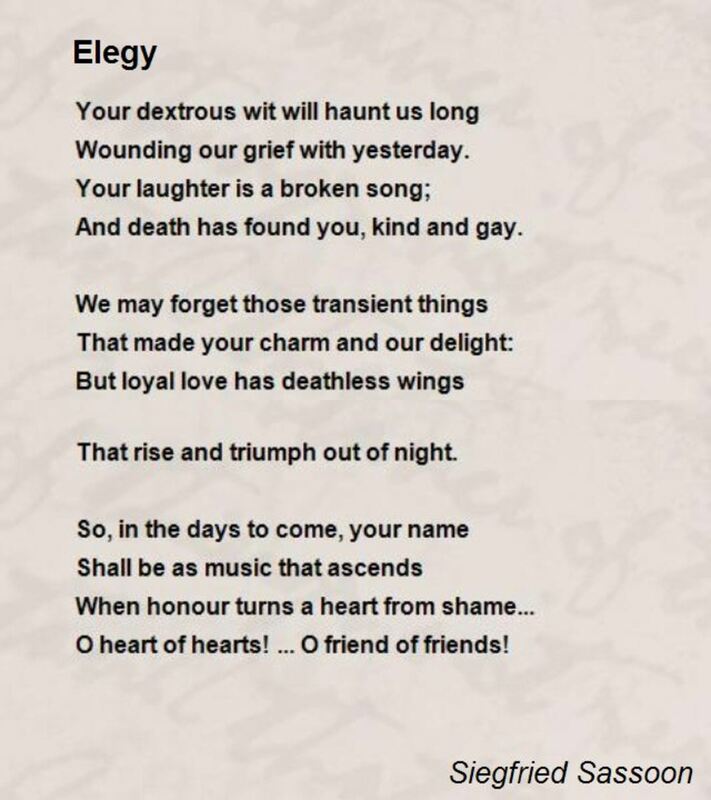 Elegy. Song of sorrow or mourning. Erasure Poems. Like blackout poems, but without the markers. The Fib. Fun form from Gregory K. Pincus. Found Poetry. Finders keepers, right? Ghazal. Couplets and a refrain. Gogyohka. 5-line poem developed by Enta Kusakabe. Golden Shovel. Terrance Hayes-invented, Gwendolyn Brooks-inspired. Haibun. Japanese form popularized by Matsuo Basho. Haiku Sonnet. 4 haiku and a couplet. Hay(na)ku. Eileen Tabios form with 3 lines, 6 words. Hir a Thoddaid. 6 lines that mostly all share the same rhyme. Huitain. French 8-liner with an ababbcbc rhyme scheme. Interlocking Rubaiyat. Used by Omar Khayyam, Robert Frost, and many others. Katauta Poems. Haiku (or senryu) for lovers. Kimo. Israeli version of haiku. Lai. Nine-liner from the French. Landay. Poem comprised of self-contained couplets. Limerick. 5 lines and naughty rhymes. List Poem. Poetry at the grocery store. Luc Bat. Vietnamese “6-8” form. Lune. Robert Kelly invention, also known as American haiku. Madrigal. Learn both the Italian and English versions. Magic 9. 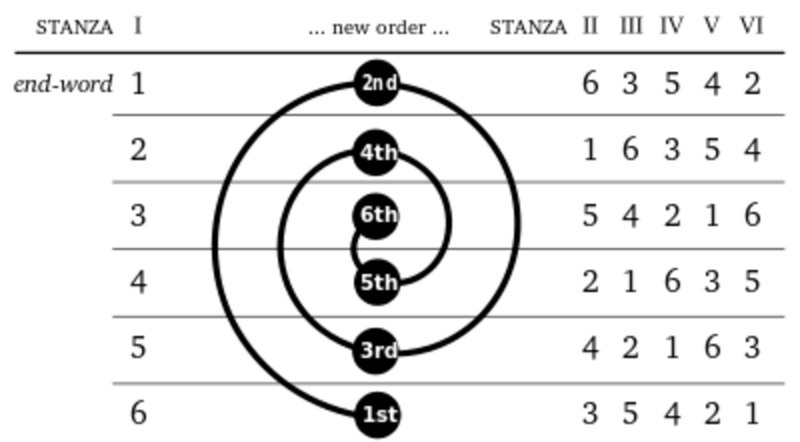 The “abacadaba” 9-line rhyme scheme. Minute Poem. 3 quatrains and a simple rhyme scheme. Mondo. Brief collaborative Q&A poem. Monotetra. Quatrain madness developed by Michael Walker. Ottava Rima. ABC rhymes in 8 lines. Ovillejo Poems. 10-liner popularized by Miguel de Cervantes. Palindrome (or Mirror Poetry). Reflective poetic form. Pantoum. The repetitive form from Malay. Paradelle. Silly and/or psycho form from Billy Collins. Prose. Just when you thought poetry was defined by line breaks. Qasida. Guest post by Ren Powell. Rannaigheact Mhor. Irish form that fits a lot of rules into 28 syllables. Rhupunt. Welsh form that offers variability and rigidity simultaneously. Rimas Dissolutas. Old French form that rhymes and doesn’t rhyme. Rondeau. 15 lines, 3 stanzas, and a lot of rhymes. Rondel. 13 lines in 3 stanzas. Rondine. 12-liner with a refrain. The Roundabout. Form from Sara Diane Doyle and David Edwards. Roundelay. Simple lyric poem that uses a refrain. Seguidilla. Spanish 7-liner that began as a dance song. Sestina. The form poets either love or hate. 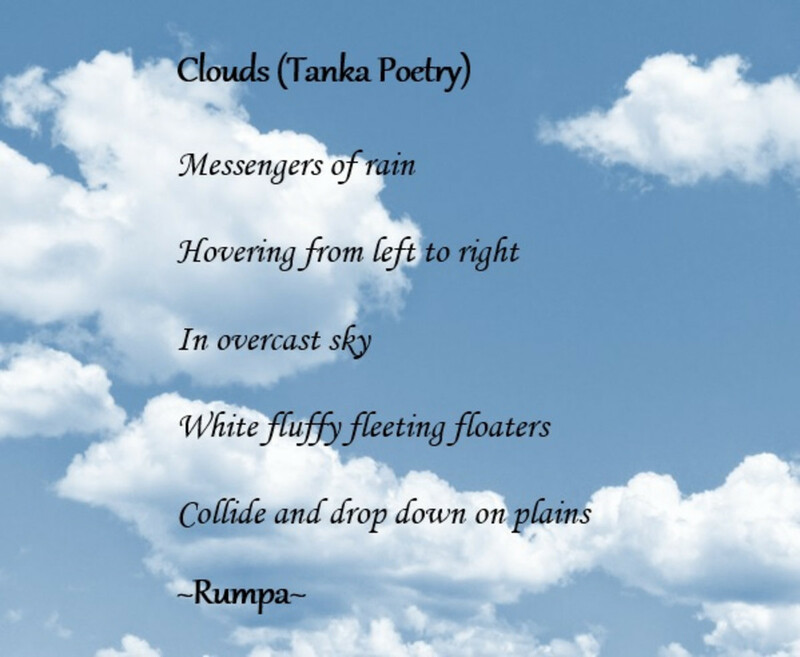 Tanka. Kinda like a haiku plus a couplet. Terzanelle. What happens when the terza rima and villanelle combine. Tricubes. 3 stanzas by 3 lines by 3 syllables. Triversen. William Carlos Williams invention: six tercets. Villanelle. Five tercets and a quatrain. There are many different types of poems. 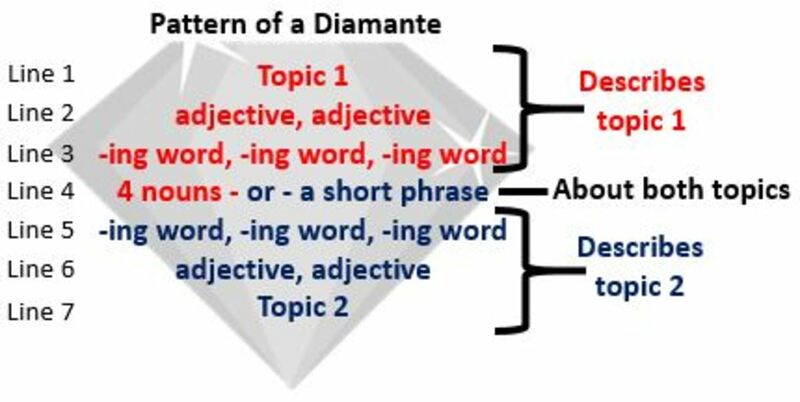 The difference between each type is based on the format, rhyme scheme and subject matter. 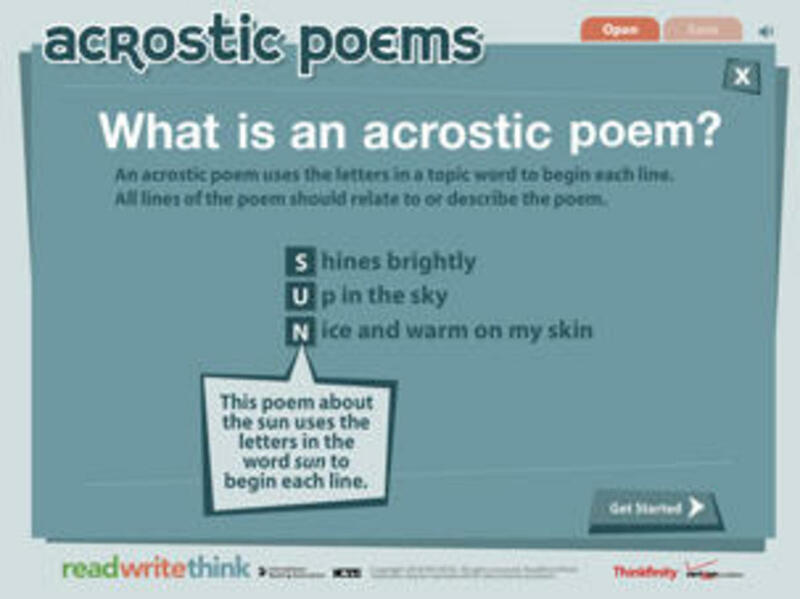 The more poetry you read and understand will help you master each different type of poem. There are many forms of poetry known today compared to generations ago. Free verse has taken its place as the most widely written stanza because I reality you don't need one. It is like playing tennis without a net or out of bound lines. It is the most common because it is the easiest to write. 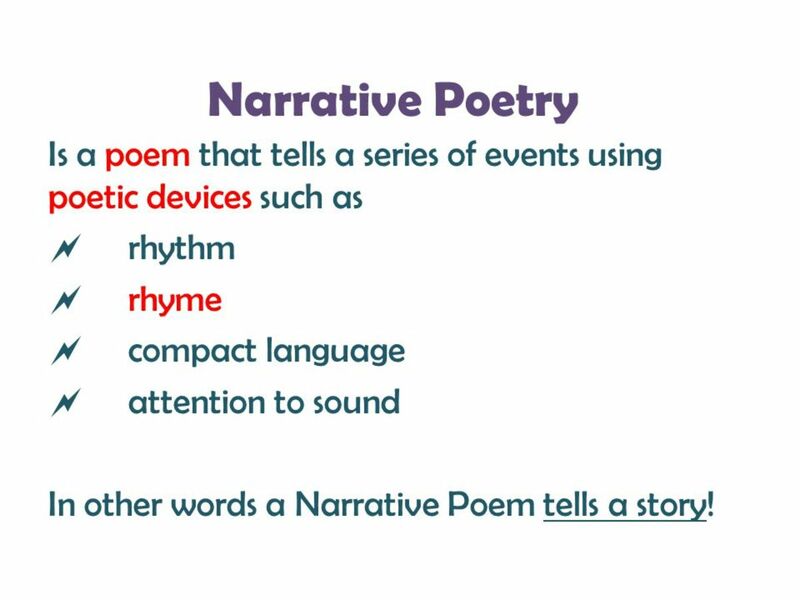 The goal of the poet is to create vivid pictures with a steady form of rhythm. I personally love Riddle poetry. I just love food for thought and trying to break to the core of a poem and thoughts of a writer. Acrostic poetry is really starting to take form throughout the world. It is fast becoming a popular stanza of poetry. Dramatic and Inspirational poetry included. We live in a generation where people love expressing themselves. Many great philosophers, like Socrates and Plato, would be proud to see how the world has evolved within writing and poetry. Knowledge is forever giving. A poem can last forever. So let is take an in depth look at all the various types of Known poetry today. A poem that has five lines and creates a mood, picture, or feeling. Lines 1 through 4 are made up of words, phrases or clauses while the first word of each line is in alphabetical order. Line 5 is one sentence long and begins with any letter. 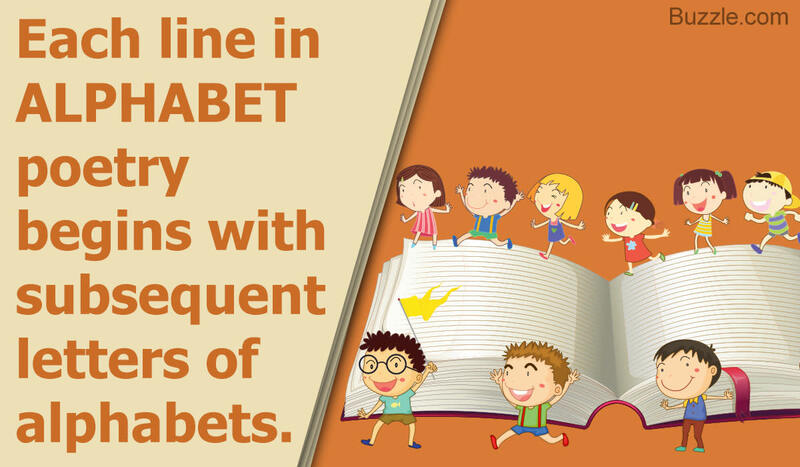 Certain letters, usually the first in each line form a word or message when read in a sequence. A poem that tells a story similar to a folk tale or legend which often has a repeated refrain. Poetry which has three stanzas of seven, eight or ten lines and a shorter final stanza of four or five. All stanzas end with the same one line refrain. A poem written in unrhymed iambic pentameter and is often unobtrusive. 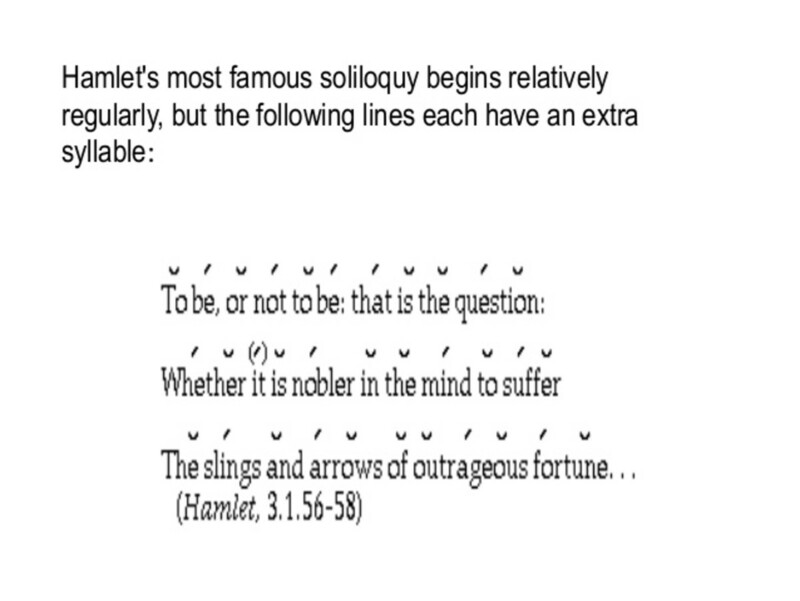 The iambic pentameter form often resembles the rhythms of speech. A poem written about one self's life, personality traits, and ambitions. Poetry that treats a serious subject as humor. Medieval Italian lyric style poetry with five or six stanzas and a shorter ending stanza. Latin expression that means 'seize the day.' Carpe diem poems have a theme of living for today. Poetry with five lines. Line 1 has one word (the title). Line 2 has two words that describe the title. Line 3 has three words that tell the action. Line 4 has four words that express the feeling, and line 5 has one word which recalls the title. Poetry which holds the principles and ideals of beauty that are characteristic of Greek and Roman art, architecture, and literature. Also known as "size poetry". Concrete poetry uses typographical arrangements to display an element of the poem. This can either be through re-arrangement of letters of a word or by arranging the words as a shape. This type of poem is two lines which may be rhymed or unrhymed. Atype of poem which is spoken to a listener. The speaker addresses a specific topic while the listener unwittingly reveals details about him/herself. A sad and thoughtful poem about the death of an individual. An extensive, serious poem that tells the story about a heroic figure. A very short, ironic and witty poem usually written as a brief couplet or quatrain. 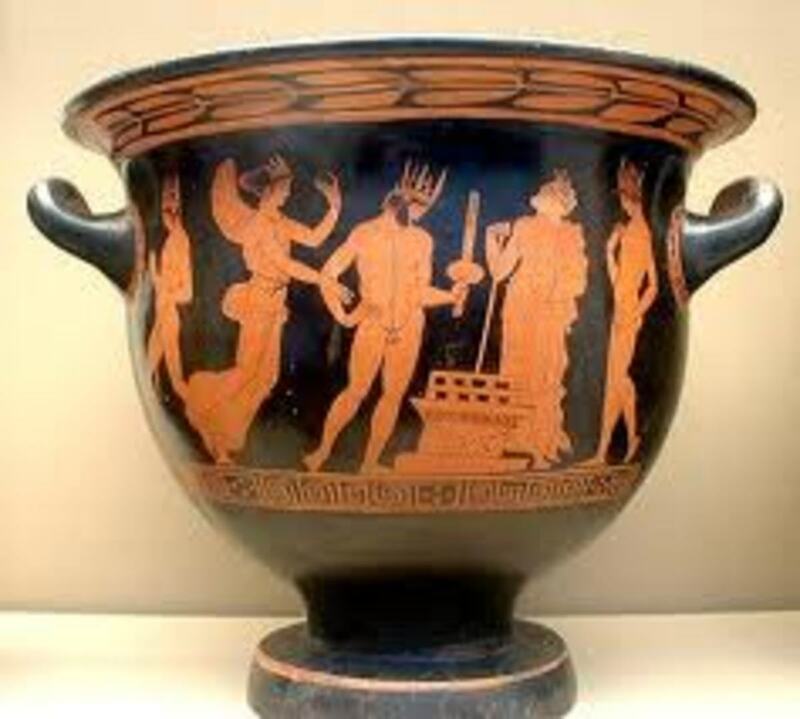 The term is derived from the Greek epigramma meaning inscription. A commemorative inscription on a tomb or mortuary monument written to praise the deceased. A poem written in honor of the bride and groom. 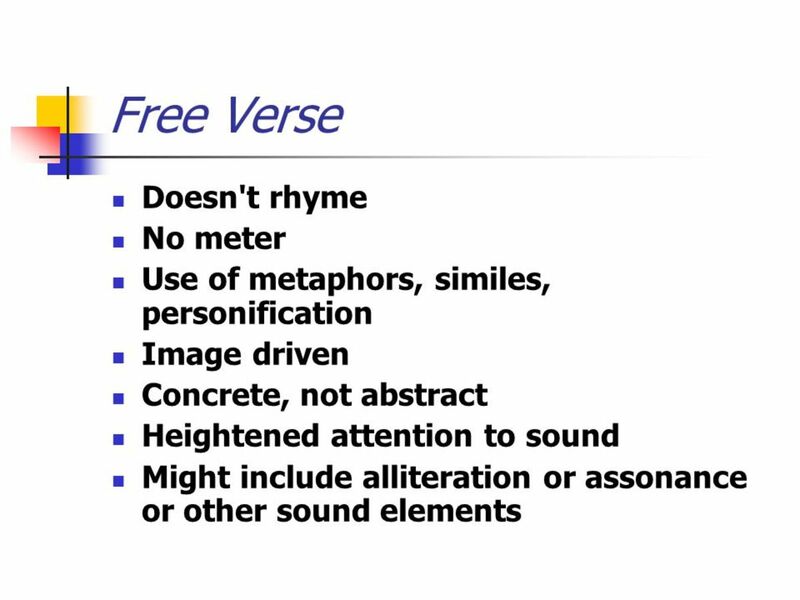 Poetry written in either rhyme or unrhymed lines that have no set fixed metrical pattern. 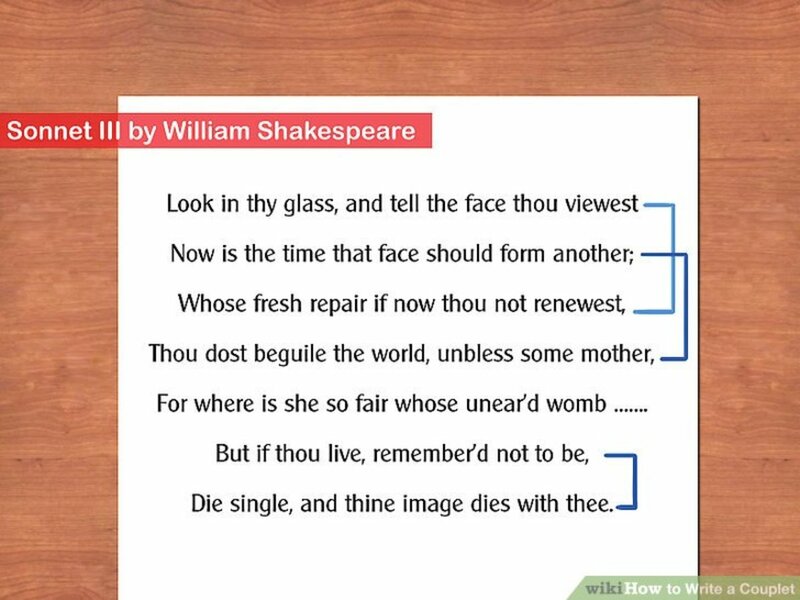 Poetry created by taking words, phrases, and passages from other sources and re-framing them by adding spaces, lines, or by altering the text with additions or subtractions. A short lyrical poem that arose in Urdu. It is between 5 and 15 couplets long. Each couplet contains its own poetic thought but is linked in rhyme that is established in the first couplet and continued in the second line of each pair. The lines of each couplet are equal in length. Themes are usually connected to love and romance. The closing signature often includes the poet's name or allusion to it. A Japanese poem composed of three unrhymed lines of five, seven, and five morae, usually containing a season word. Short lyric poem written in two or four-line stanzas, each with its the same metrical pattern, often addressed to a friend and deal with friendship, love and the practice of poetry. It is named after its creator, Horace. One short syllable followed by one long one five sets in a row. Example: la-LAH la-LAH la-LAH la-LAH la-LAH. Used extensively in sonnets. Poetry that either depicts a peaceful, idealized country scene or a long poem telling a story about heroes of a bye gone age. Neither the three part form of the pindaric ode nor the two or four-line stanza of the Horatian ode. It is characterized by irregularity of verse and structure and lack of correspondence between the parts. A sonnet consisting of an octave with the rhyme pattern abbaabba followed by six lines with a rhyme pattern of cdecde or cdcdcd. A long narrative poem, especially one that was sung by medieval minstrels. A short sometimes vulgar, humorous poem consisting of five anapestic lines. Lines 1, 2, and 5 have seven to ten syllables, rhyme and have the same verbal rhythm. The 3rd and 4th lines have five to seven syllables, rhyme and have the same rhythm. A poem that is made up of a list of items or events. It can be any length and rhymed or unrhymed. A poem that expresses the thoughts and feelings of the poet. Many songs are written using this type of writing. A quatrain in iambic tetrameter with a rhyme scheme of abba -- named after the pattern used by Lord Tennyson. Poetry that tells about the word. It uses the letters of the word for the first letter of each line. A poem that tells a story. A lengthy lyric poem typically of a serious or meditative nature and having an elevated style and formal stanza structure. A poem that depicts rural life in a peaceful, romanticized way. A 14-line sonnet consisting of an octave rhyming abbaabba followed by a sestet of cddcee or cdecde. A ceremonious poem consisting of a strophe (two or more lines repeated as a unit) followed by a an antistrophe with the same metrical pattern and concluding with a summary line (an epode) in a different meter. Named after Pindar, a Greek professional lyrist of the 5th century B.C. A stanza or poem consisting of four lines. Lines 2 and 4 must rhyme while having a similar number of syllables. 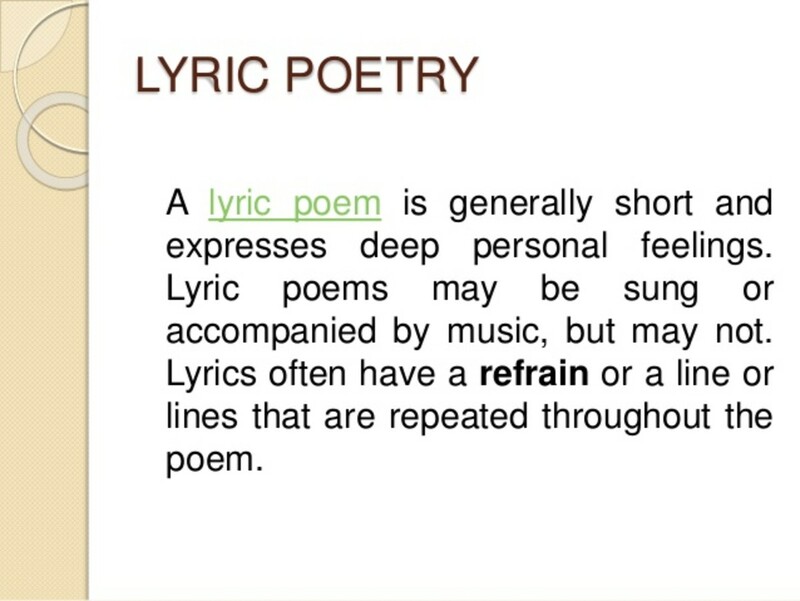 A rhyming poem has the repetition of the same or similar sounds of two or more words, often at the end of the line. A type of poetry consisting of stanzas having seven lines in iambic pentameter. 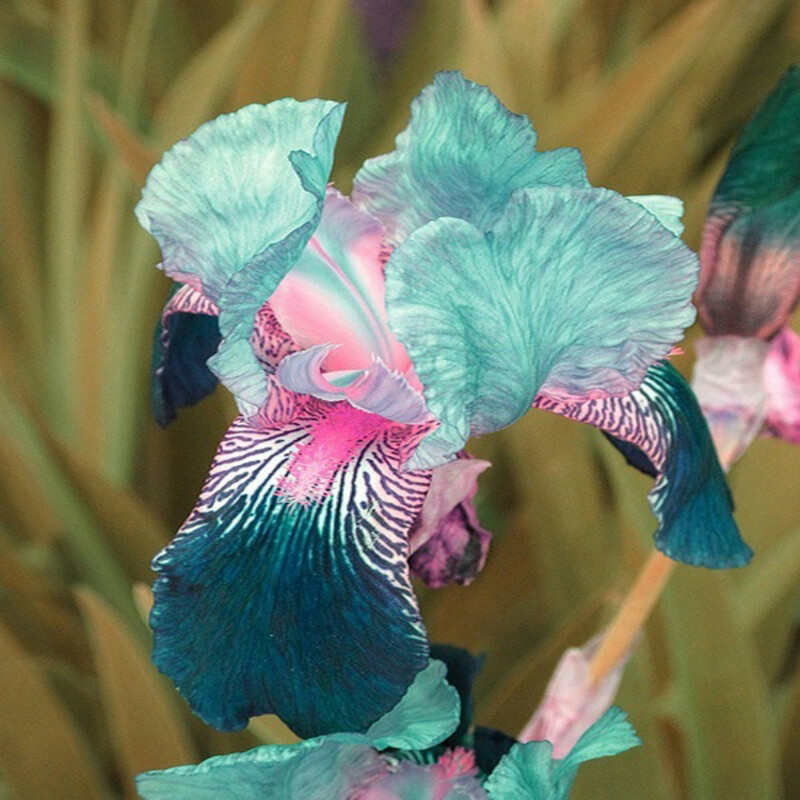 A poem about nature and love while having emphasis on the personal experience. A lyrical poem of French origin having 10 or 13 lines with two rhymes and with the opening phrase repeated twice as the refrain. A short Japanese style poem, similar to haiku in structure that treats human beings rather than nature: Often in a humorous or satiric way. A poem consisting of six six-line stanzas and a three-line envoy. The end words of the first stanza are repeated in varied order as end words in the other stanzas and also recur in the envoy. A 14-line sonnet consisting of three quatrains of abab cdcd efef followed by a couplet, gg.Shakespearean sonnets generally use iambic pentameter. ShapePoetry written in the shape or form of an object. This is a type of concrete poetry. Alyric poem that consists of 14 lines which usually have one or more conventional rhyme schemes. Intended primarily for performance, sound poetry is sometimes referred to as "verse without words". This form is seen as the bridging between literary and musical composition in which the phonetics of human speech are used to create a poem. A Japanese poem of five lines, the first and third composed of five syllables and the other seven. A type of poetry consisting of 10 or 11 syllable lines arranged in three-line tercets. A single metrical line of poetry. A19-line poem consisting of five tercets and a final quatrain on two rhymes. The first and third lines of the first tercet repeat alternately as a refrain closing the succeeding stanzas and joined as the final couplet of the quatrain. The visual arrangement of text, images, and symbols to help convey the meaning of the work. Visual poetry is sometimes referred to as a type of concrete poetry. Know of a type of poetry I forgot to mention and should include? Email me of leave your feedback below please, thank you. I love your hub, I totally relate! To Doug Turner Jr, out of all my work I acually like you just picked one line. It's very simple actually. Jesus knew Judas was the one to turn on him. He knows of deceit and betrayel.Therefore, he knows he insides of all man. He knows what we have done, the bad and good.Thanks for reading ") Appreciate the comment. Jesus and God watch over all of us. I loved your intro. I concur. "Jesus has seen and felt the insides of all men" -- not sure where you're going with that one. Your poetry is so beautiful. Thank you for visiting my hub. I attempted to click on, ' The power of poetry ' The page was no longer there.